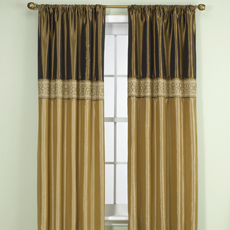 I bought some Addison window panels in Antique Gold from Bed, Bath and Beyond. I love them but don't know what color comforter set to buy. My walls are sage green. I would opt for a rich cream or pale sandy-gold if I were you. This will add light to the room and give you a really classy, classic look. If you choose to go with cream, a couple of large pale gold sham pillows on the bed will make a really nice finishing touch. If you could find a pale gold pillow fabric that had a touch of sage green then even better as this would, of course, bring the wall color into it and give you a really cohesive look.